For the last couple of years, I’ve been following iPad application appearance in the space of engineering and manufacturing. I expected this application to come much earlier. So, I wanted to say the same word Ricky Jordan said in his blog. Finally! 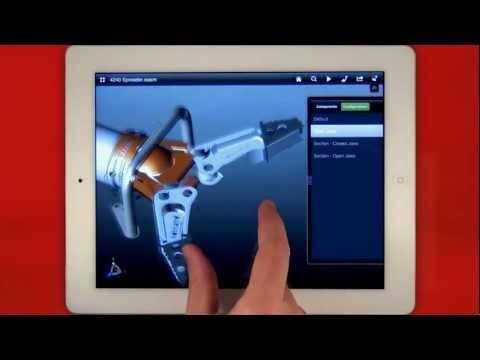 SolidWorks (or how it is named now 3DS SolidWorks) just made a release of e-Drawing iPAD application. It is available on the App Store. I installed it on my iPad just few hours ago. It looks very nice. Email integration is supported. In addition, it is capable of viewing other formats (you may note licensing terms going to TechSoft3D, Open Design Alliance and few others) in about section. Home screen, menus, controls – everything looks familiar to somebody who is using iPad. Side bar is nice and allows you to navigate inside of assembly. I didn’t find support for views, measurement, and other useful functions. I believe SolidWorks keeps it for future versions. The price is $1.99. The Apple iTunes policy is complicated when it comes to corporate purchasing. Does e-Drawing iPad app worth $1.99? My answer is yes. Will engineers buy e-Drawing iPad for $1.99? A good question. I’d be very interested to see the number of uploads within few weeks and months.